Today marks the 126th anniversary of the Eiffel Tower; it opened to the public on March 31, 1889. Built in 1889 as the entrance arch to the 1889 Exposition Universelle (World's Fair), it was initially criticized by for its design and mocked as "a truly tragic street lamp." Now, it has become the most visited paid monument in the world with almost 7 million annual visitors. The tower had received 250 million visitor by 2010, 75% of them were from overseas. At 324 meters or 1,063 feet, the Eiffel Tower surpassed the Washington Monument to become the tallest man-made structure in the world. It held the title for 41 years until the Chrysler Building in New York City was built in 1930. In comparison, the Stratosphere Tower in Las Vegas stands at 350.2 meters or 1,149 ft; Paris Las Vegas Hotel & Casino has a half scale, 165-meter or 541-foot tall replica of the Eiffel Tower. Google has featured an Eiffel Tower Doodle by artist Floriane Marchix on its web page to commemorate the 126th anniversary of the tower's public opening. 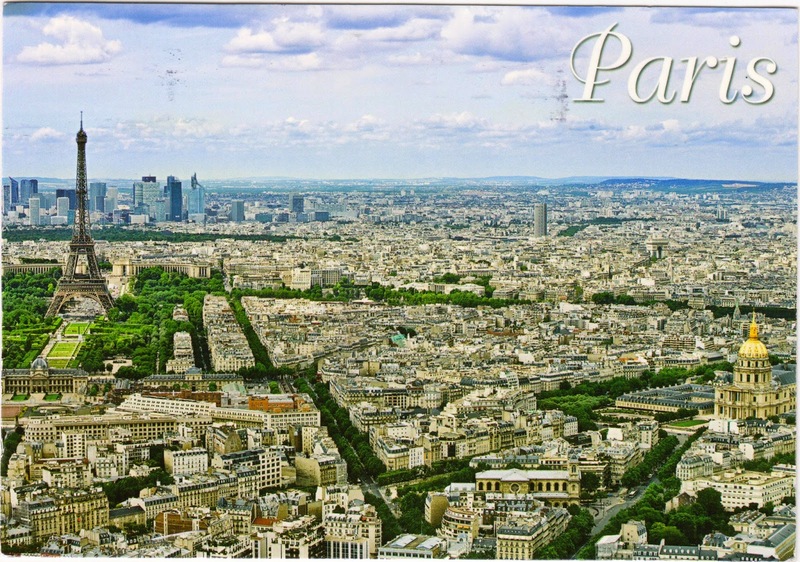 Postcard FR-430903 from France shows a view of Paris from Tour Montparnasse with the Eiffel Tower and the Champ de Mars on the left side, and Les Invalides on the lower right.